For the ninth time in the past 10 years, Team Canada has left the Ivan Hlinka Memorial tournament as champions. This year, they defeated the host Czech’s to reclaim their title after falling all the way to fifth in 2016. With another terrific under-18 tournament in the books, the official start of the scouting season is well under way. Several upcoming draft eligible players performed exceedingly well and have built a sturdy foundation for the most important year of their lives thus far. Dynamic forward, Dimitriy Zavgorodniy led the tournament in scoring (5+5) for the fourth-place Russians. The 16-year-old was a consistent threat to score and displayed terrific agility, vision and finishing skills. At just 5’9, he will need performances like these to vault himself onto the first page of many scouts’ lists. Dynamic right-handed defenseman, Adam Boqvist shone brightly for the Swedes. The 5’11 rearguard scored a silky goal in the bronze medal game and added seven assists throughout to finish with eight points in five contests. Boqvist hasn’t yet turned 17-years old and will remain in Sweden to play in the U20 SuperElit league this fall despite having been draft by the London Knights in the CHL Import Draft. Rasmus Kupari produced two goals and seven points in four games for the Finnish squad; leading the charge offensive for the team and displaying the creativity, quickness and deft playmaking ability of a centre to watch climb the rankings this year. He will fight for a job with Kärpät of the Finnish Liiga. Joseph Veleno captained the dominant Canadian club that torched the competition by outscoring opponents 22-8. He was noticeable on both sides of the puck and looked every bit the part of a top 10 selection this June. The most recent player to be granted exceptional status displayed his ability to change the pace to suit his designs. That’s a relatable skill with many of the best players in the world. His vision and patience was on full display. Veleno will head back to the QMJHL this fall and contend for the league’s most productive player. Spokane Chiefs’ defender, Ty Smith, Niagara IceDogs’ centre, Akil Thomas and Jack McBain of the Ontario Junior A circuit all stood out for Canada in their gold medal endeavor. Smith was clearly the team’s best all-around defender on a squad built around its top blue liners. Thomas displayed his unrelenting motor and two-way acumen in shutting down opponents, while McBain played on Veleno’s wing and used his long reach to protect the puck well and created space with his heavy, skilled game. A few things to note for these rankings. While I pride myself on the extensive film and live viewings I can take in, I also have a full-time teaching job, a wife, young child and a nasty sleep habit that just won’t quit. As such, some players on the list below are ranked higher or lower simply due to exposure I’ve had thus far to build an opinion on. That’s the beauty of the early scouting season; it’s a foundation to be built upon. I also rely heavily on the eyes and ears of some scouts whom I trust very much. Being able to assess talent is as a collaborative venture as it is a personal one. Using a network of knowledgeable people can help steer the direction of the ship, but ultimately, it’s up to the individual to decide where and how to value them. There will surely be some discrepancies from some established services and that’s the beauty of it. My opinion, like yours, is individualized. Incredible speed, agility, instincts and finishing skills. 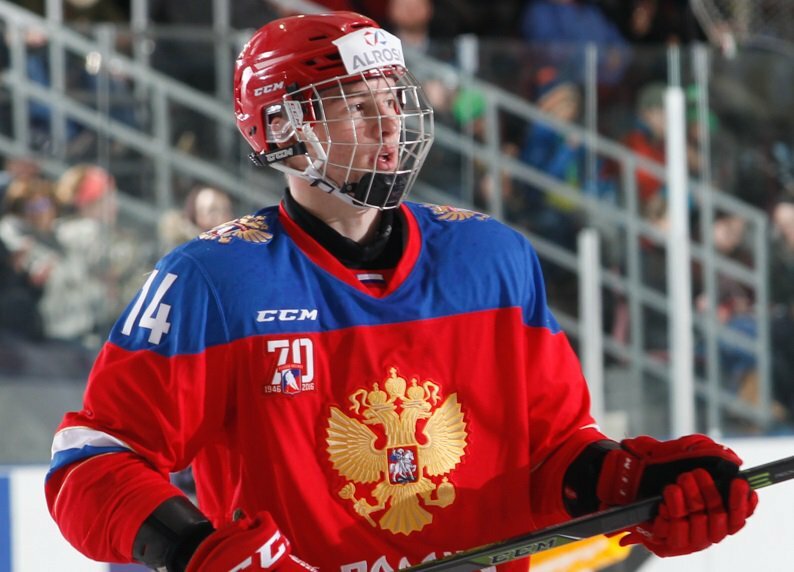 The younger brother of Detroit Red Wings’ first rounder, Evgeny, is the complete offensive package. He was the best player in the USHL last season as a D-minus one and will head to the OHL’s Barrie Colts after being selected first overall in the CHL Import Draft. He is the best player at this moment and projects as a dynamic first line threat. Expect to see him in the NHL in 2018. What’s so impressive about the smooth and creative Swede is just how good he could one day become. His speed and mind are his best weapons, often thinking moves ahead even as a 16-year-old playing in the SHL. Only twice in the last two decades has a defender gone first overall – Aaron Ekblad in 2014 and Erik Johnson in 2006, and Dahlin could certainly join that exclusive company. He has all the earmarks of a franchise changing defender. The full-package of tools: Great edgework, acceleration, vision and puck-protection skills. The 17-year-old is already a consummate worker in the defensive end and should witness massive point totals in his third junior season. The powerful winger has shown well against men in his native-Czech top league. Another agile and speed-driven player, Zadina will cross the pond and join the Halifax Mooseheads in a continued theme of top prospects suiting up the perennial QMJHL powerhouse. With soft hands and great awareness, Zadina will likely challenge for the top of the league’s scoring leaderboard. Boqvist plays an extremely similar game to his Canadian counterpart, Merkley. Dynamic puck skills, terrific vision, speed, smarts… he may even be more developed in the defensive end at this point too. His late birthday means he is just a month away from being eligible for the 2019 class further illustrating how massive his potential is. The reigning OHL Rookie of the Year, boasts elite offensive skills from the back end. Vision, passing, dynamic edges, top end speed and acceleration. His play in his own zone and decision-making without the puck is still a work in progress, but the right-handed defender has the makings of a dynamic point-producer. The dynamic two-way defender displayed his full arsenal of weapons at the Hlinka tournament after doing much of the same with the Spokane Chiefs a year ago. The former first overall pick in the 2015 WHL draft, Smith is an excellent skater who demonstrates poise and patience with the puck. His outlets are crisp and his head is always up. That’s right, another Tkachuk. The younger brother of Matthew is just as feisty and loves to engage in a power forward-style game. His acceleration and top speed needs some fine tuning but he could very well have the softest hands of anyone in his clan. He’s as old as you can get for this class – missing the 2017 draft by a day, so he may be ready sooner than most prospects coming off the draft floor. He heads to BU this fall. and his head is always up. Could use some more zip on his shot, but that should come with improved strength. Wouldn’t you know it, another smaller, offensive defender comes up. Get used to it in this class. Hughes is consummate playmaker and boasts the elite speed needed to thrive at his stature. After leading the charge for the USNTDP U18 squad last year, he moves to the University of Michigan this fall to learn in a strong program. Owns some of the best pure puck skills in the draft. The goal scoring forward doesn’t shy away from attacking dangerous scoring areas and boasts strong speed and quick feet. He’ll be back with USNTDP this fall before heading to Harvard in 2018-19. Skills for days and a package to translate it to the NHL. Watch out for Kotkaniemi, he could be driving way up this list come June. Big, power centre may take a little longer to develop but could be a player you build around down the middle. Likely doesn’t have the tools to be a front line offensive threat. Slight and slippery, he performed quite well in short USHL stint. Expect some big totals with the Program this year. A buzz-saw of a player. Needs to add strength, but moves as quick with the puck as he does without. In line for more responsibility with Niagara this season. Perhaps the most explosive skater in this class. Likely transitions to the wing where he can run a little wilder. Strong puck-moving defender expected to take on bigger minutes with London this fall. Has looked terrific paired with Canucks’ top prospect, Olli Juolevi. Speed runs in the family. Isn’t as hard-nosed as older brother, Michael but plays a similar game. Needs to finish with more consistency. All the skill you can handle in a 5’9 frame. Needs strength and then we can talk about the defensive side of things. High-end processing skills and offensive awareness but needs to stay engaged and keep his feet moving. Strong two-way defender needs quicker feet. An interesting player. Flashes brilliance and could end up in the top 15, or slide all the way to the 50’s. A player to watch. Hasn’t lit up the scoresheet like his skills suggest he should. He’ll get a ton more ice with Timra this season with Elias Pettersson moving up. Calm and collected are his trademarks. Will be leaned on heavily in Moose Jaw this season. Small, dynamic right-shot defender (seems to be a theme, eh?) Needs to thicken up and improve positioning to handle stronger players. If you have any questions on specific players or just want to lambaste me for having ‘Player X’ far too high, or ‘Player Y’ far too low, feel free to follow me on twitter @CrazyJoeDavola3 where I’m often giving fantasy hockey advice and prospect information that I’m sure at least someone is listening to. Cam Robinson is a senior writer/scout for the Vancouver Canucks on DobberProspects and pens the weekly column Frozen Pool Forensics as a staff writer for DobberHockey. He’s a proud contributor to the Fantasy Prospect Report and Annual Fantasy Guide and has somehow managed to go 31 years without ever having a really good pickle.